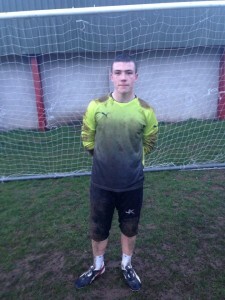 On Tuesday (13th Aug ’13) Just4keepers goalkeeper Dean Mahon (St Joseph’s FC) kept a clean sheet on his debut for Ireland. Wearing the No.1 Jersey, the 6ft 15 year old was impressive in keeping Glasgow Celtic at bay in a match held at the Scottish clubs Barrowlands training HQ. Ireland ran out 2-0 winners. Pictures below show Dean wearing the No.1 for Ireland, training at Just4keepers in Bray & Wicklow and Dean with Craig Bellamy at his trial with Cardiff City this year.